Earn 25985 loyalty points when you order this item. Outs: RS232, IR in/out, Trigger, RF. This hi-fi system combines Tannoy Prestige GRF speakers with Primare's superb A60 power and PRE60 pre amplifier combination, the best sounding system with GRF we've heard yet. This latest Prestige speaker - as with the other most recent GR (Gold Reference) models, benefits from high power amplification and the Primare A60 power amplifier is perfectly up to the task boasting an impressive 250W per channel into 8ohms. 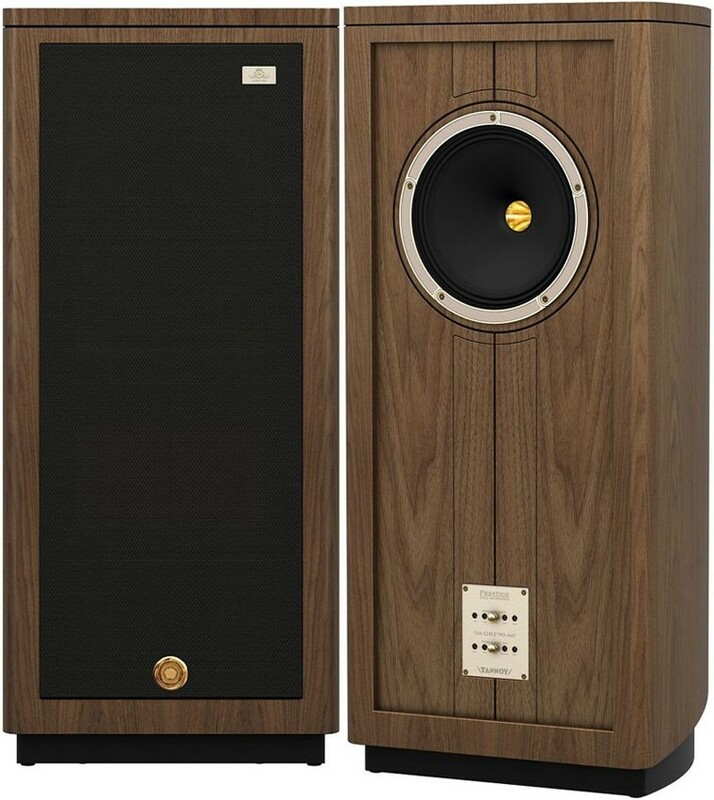 Tannoy Prestige GRF were built to celebrate Tannoy's 90th Anniversary and feature a 300mm (12") Gold Reference Dual Concentric driver housed in a beautifully designed, oiled walnut cabinet. GRF essentially combines the finest in Tannoy cabinetry with the most modern design from the Prestige range, in cabinets that will fit comfortably into most living rooms, providing the opportunity for music lovers to own an exclusive and high-performance loudspeaker from the world-famous Tannoy Brand. For more info, view our main GRF page. 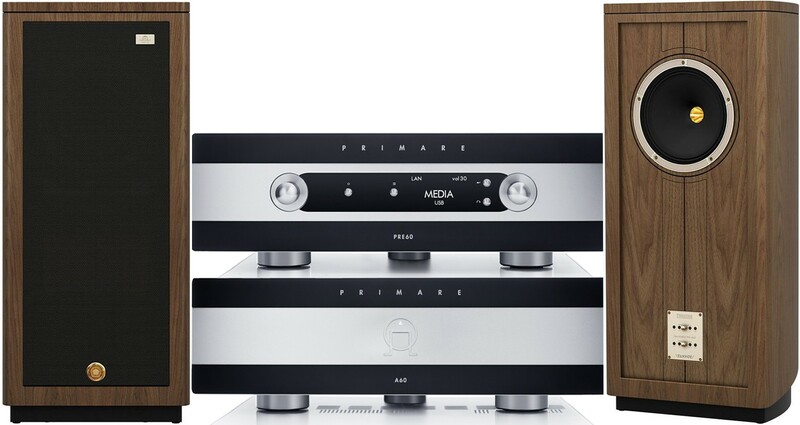 Primare A60 is a reference quality, fully balanced stereo power amplifier best matched with the PRE60 pre amplifier also featured here. 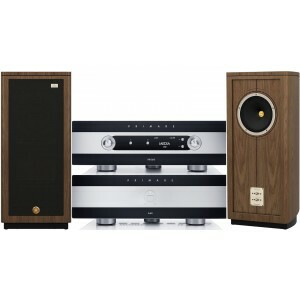 In addition to reference level performance, the PRE60 offers state of the art streaming and both look stunning in the two-tone finish, which - similarly to the GRF, offers the latest in performance design with a nod to traditional hi-fi. For more information, visit our main A60 page and main PRE60 page. We have the GRF on permanent demonstration in our showroom along with other Prestige models including the smaller Kensington's. We can arrange a listen of these speakers and system in our showroom or anywhere in the UK for seriously interested buyers (we'll visit you with the system and can leave it with you on loan if desired to make sure you're sure before making the investment. We can of course also offer advice on suitable matching vinyl, CD and streaming music sources. To arrange a listen or discuss this system further, please call or e-mail us and we'll give you a call back to discuss your options.